Soap scum. Sometimes it seems like you’re in a never-ending battle with the stuff. Because no matter how often you clean your tile shower soap scum will build up from time to time. And it’s not always from lack of effort on your part. Soap scum forms when fatty acids present in soap react with hard water ions—calcium and magnesium. And it’s this reaction that produces that filmy substance in your tub or shower. That doesn’t mean not using a cleanser. Bar-soap may be a well-meaning form of soap but is actually a major cause of your soap scum woes. The paraffin in bar soap is quick to react with those ion particles in tap water. Forming that sticky, pasty, hard-to-clean substance that we see clinging to our walls and shower doors that drives us all crazy. A longterm improvement may be to change your form of cleanser from a bar to a liquid, or body cleanser to avoid the parrafin problem going forward. A liquid soap or shower gel is less likely to react with your hard water’s calcium and magnesium ions as quickly. To be clear, this will slow the formation of this pesky build-up, but unfortunately not completely eliminate it. As liquid soap versus bar soap will only reduce the rate of buildup, we still need a solution to the existing problem and its future management. 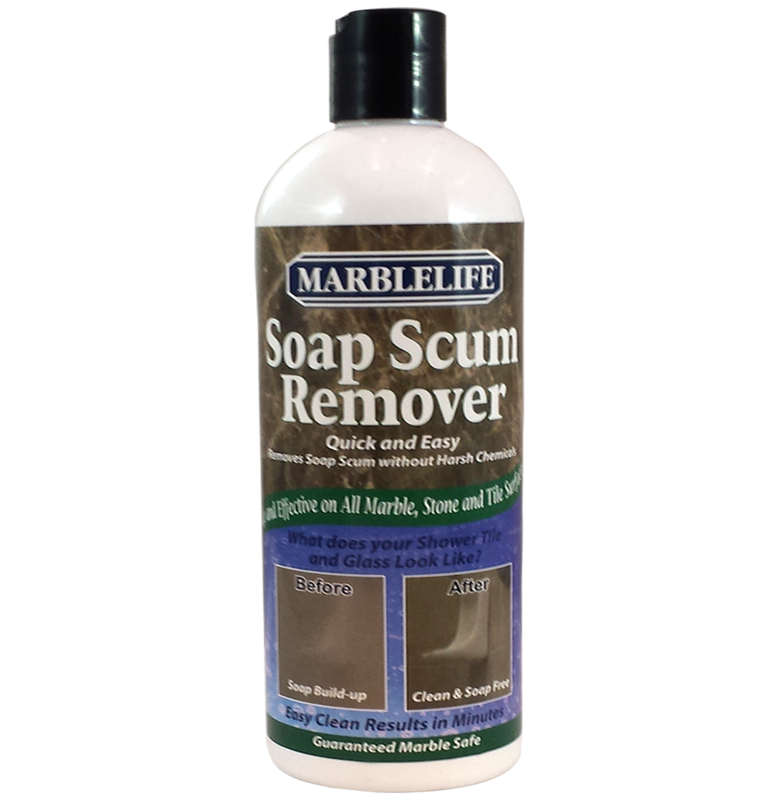 Enter MARBLELIFE SOAP & SCUM REMOVER. Before you step from your shower make sure all those soapy suds get rinsed down the drain. Leaving even a few bubbles remaining in corners or on walls will result in build-up as the water evaporates leaving the soap residue behind. This is because it’s giving the ions from the water and the fatty acids from the soap more time to react in an already warm and moisture-rich environment. The easy answer here is the squeegee. Either squeegee now or clean soap scum later. This really is a choice that weighs the time and choice. 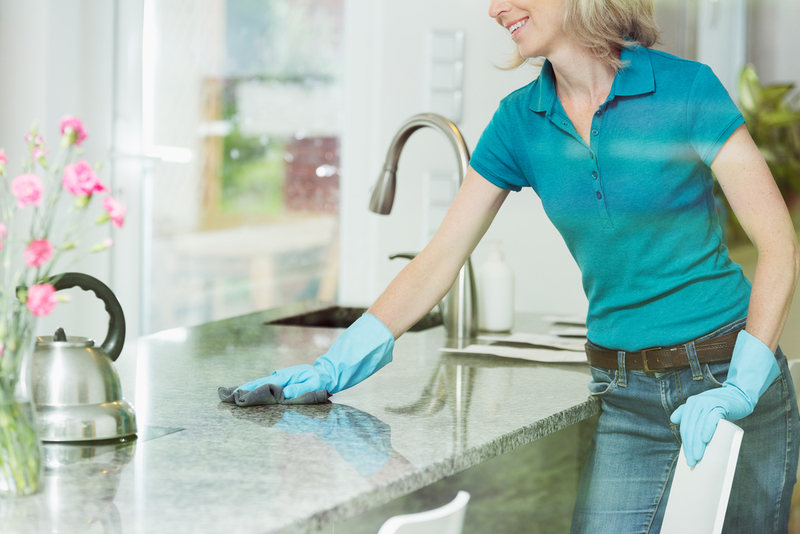 We either reduce the material available to settle on our surfaces as soap scum, or we accept that with MARBLELIFE SOAP SCUM REMOVER we can quickly address this at one time later. Whenever you do start to notice soap scum creeping into your shower, clean it immediately. Our MARBLELIFE SOAP SCUM REMOVER is odorless and specifically engineered to be safe on many sensitive surfaces including marble, tile, glass, metal and plastic enclosures and fixtures. Formulated to quickly remove soap scum to allow our professional craftsman to access the actual surface when a restoration process is needed, MARBLELIFE SOAP SCUM REMOVER has been optimized to be QUICK and EASY. In fact, it will even let you know by feel when you have cut through the soap so that no time is wasted. Regular use of this product is the best method for keeping soap scum at bay. One additional hint, not all white build-up is soap. Hard water sports caused by the build-up of calcium can also show as white. The quick hint here is lemon juice (but not on marble). Lemon juice can dissolve calcium deposits to quickly remove these from the surface, once the soap build-up is gone, while leaving a nice fresh sent. So why not on marble? Marble is compressed calcium so lemon juice and acids in general will dissolve the stone, removing first the glossy shine and then pitting the surface. If this happens, you will not be able to fix it as the stone has been removed, but have no fear MARBLELIFE’s Professional Craftsman can rehone the damaged surface to restore a gloss. If you have calcium deposits on marble, call a craftsman. For any other soap scum or tile shower-related questions or concerns, feel free to get in touch with your local MARBLELIFE office. One of our stone craftsman will be happy to provide you with any information you need. MARBLELIFE SOAP SCUM REMOVER is also safe for use in the kitchen to clean microwaves, ovens and grills. Anywhere that burned on food has become difficult to remove crud, you will see come off with ease. Give us a try, and stop scrubbing. With the right product you can replace that scrubbing frustration with the satisfaction of having found a smart solution to a pesky problem. A truly unique product, employing an engineered abrasive that will absolutely not scratch sensitive surfaces in tile showers, including glass, metal and plastic enclosures and fixtures.